LEE'S SUMMIT, MO. 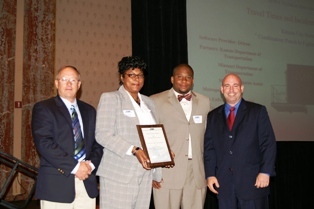 –Kansas City Scout won the 2008 Technical Innovation Award from the Kansas City Chapter of the American Public Works Association for Scout’s Travel Time Reliability and Incident Management Implementation. The award was established to provide recognition for an individual, team or organization for the development and implementation of a creative idea, device, process or system that enhances the goals of public works in serving the public and protecting the environment. The award was presented to E. Jason Sims, Manager of Kansas City Scout, Gina Myles, Community Relations Coordinator and Rusty James, Incident Management Coordinator at the National Public Works Week luncheon ceremony held today at the Muehlebach Tower, in downtown Kansas City, Missouri. Scout’s nomination “Travel Time Reliability and Incident Management, Kansas City’s Scout’s Combination Punch for Fighting Congestion”, highlighted Scout’s recognition of the need to reduce congestion on area interstates and realization that conventional methods such as pavement expansion had already been exhausted. As a solution Kansas City Scout launched Travel Times, with emphasis on Incident Management as key weapons in its fight against congestion in 2007. Travel Times represents the time it takes a driver, driving at current freeway speeds to travel from one fixed point to another target. Traffic Incident Management is the process of coordinating resources of different partnering agencies and private sector companies to identify, respond to, and clear traffic incidents as quickly as possible. With Travel Times and Incident Management Scout strives to reduce the impact of incidents on safety and congestion. As a result of this program Kansas City Scout has seen a 30 percent reduction in clearance of incidents on the Scout system.